As Jalopnik's new Weekend Editor, one of my first acts will be to bring back a series I rarely had time for during the weekday grind: Engine Of The Day! Today we're honoring Detroit's first mass-produced overhead-cam V8 engine (yes, it beat GM's Northstar to the marketplace; no, jillion-dollar factory-racer engines like the 427 Cammer don't count as "mass-produced"), an engine that's proven to be very reliable as well as capable of serious power numbers: the Ford Modular V8/V10 family. If it's a Ford, Lincoln, or Mercury vehicle made after 1992 and it has room for a V8, odds are it has a Modular; everything from the F-series truck all the way up to the Ford GT has been a Modular recipient since the 16-valve, 4.6 liter Modular V8 made its debut in the '91 model year. The Mustang started going Modular in 1994 and ditched the old pushrod Windsor V8 completely by 1996. 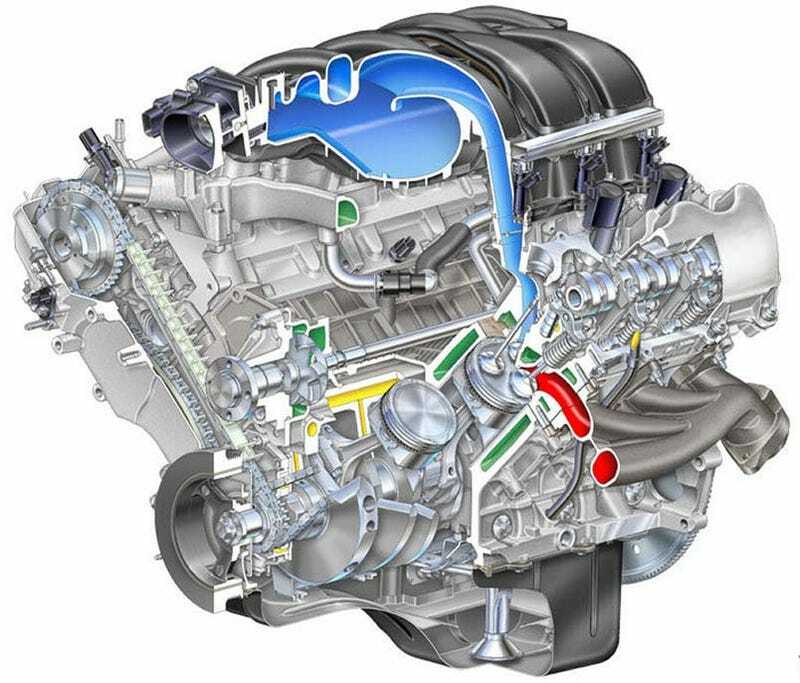 You can find the Modular V8 (which, despite the name, doesn't have much parts interchange between versions- this in keeping with hallowed Ford V8 tradition) in 4.6, 5.0, and 5.4 liter variants, with single or double overhead camshafts, with two, three, or four valves per cylinder, naturally aspirated or supercharged, and with blocks made from cast-iron or aluminum. The V10 version, displacing a monstrous 6.8 liters, has been powering Ford trucks for more than a decade.